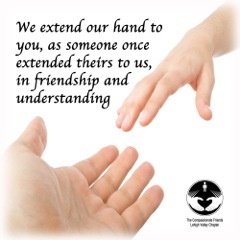 Like all Compassionate Friends Chapters, the Topeka TCF Chapter charges no dues or fees for bereaved family members to participate in our monthly support group meetings, to receive our newsletter, or to utilize the resources in our lending library. We rely on donations to help fund the expenses of the Chapter that include the printing and postage for our newsletter that currently reaches 300 bereaved families in northeast Kansas as well as over 100 professionals. It currently costs about $350 to print and mail each issue of the newsletter. We also have the printing and postage expenses for sending out First Contact Packets to families within a 60-mile radius of Topeka who have experienced the death of a child, regardless of the age of the child or the cause of death. Other expenses for the Chapter include printing of handouts on specific meeting topics, our annual nonprofit postal permit fee (currently $220), supplies for meetings and memorial events, purchase of books for our lending library, etc. The Chapter is managed by an all-volunteer force of bereaved parents and siblings and has no paid staff. We only have one actual fundraiser each year and that is our Walk to Remember. To participate in the Walk, participants must pay an entry fee and sign a liability release form. More information on this event may be found under the “Special Events” button. To help underwrite the expenses associated with running the Chapter, individuals may make a Love Gift donation in any amount in memory of their child, grandchild or sibling, or they may choose to Sponsor a Newsletter in their memory. Cost to sponsor a newsletter is $30 and sponsors are acknowledged on the front page of the newsletter they sponsor. Our newsletter is published six times a year. Your name, address, and either phone# or email address in case there are questions on your gift. Name of person in whose memory the Love Gift is given along with their birth and death anniversary dates. Newsletter in which you would like your Love Gift acknowledged (Jan/Feb, Mar/April/May/June/July/Aug/Sept/Oct, Nov/Dec). Note: We normally acknowledge a Love Gift donation in the month closest to either the birth date or death anniversary date of the individual being remembered unless otherwise instructed by the donor. Name of person in whose memory the Newsletter Sponsorship is given along with their birth and death anniversary dates. Newsletter in which you would like to sponsor (Jan/Feb, Mar/April/May/June/July/Aug/Sept/Oct, Nov/Dec). We would also like to remind you that many businesses and companies have Matching Contribution programs. Be sure to check with your employer's personnel department to see if this is available at your workplace. By participating in a Matching Contributions program you may be able to have your donations to the Topeka TCF Chapter (Love Gift, Newsletter Sponsorship, Other) matched by your employer. This is a great way to support the Topeka TCF Chapter and make your personal donations count for even more income for the Chapter. We encourage you to check it out. Dillions Community Rewards Program - JOIN NOW! organization when enrolling at the website listed below. The name our group is listed under is: The Compassionate Friends/Topeka Chapter. Just click on the link below for more information about how you can help support the Chapter. Participating does not affect your fuel points earned through Dillons. All donations to the Topeka TCF Chapter are fully tax-deductible and a formal acknowledgement for tax purposes will be provided for donations $250 or more. The Topeka Compassionate Friends Chapter is a 501(c) (3) nonprofit organization as designated by the Internal Revenue Service. Our EIN tax number is 48-0891964.